Online education has opened the doors to high-quality, accessible qualifications to students across the globe. While this revolution in education has many positives, it comes with its own unique challenges too. One of these challenges is the online discussion forum. Forums give students a space where they can communicate directly with their fellow students and teaching team; a space characterised by interactivity and immediacy. How can online facilitators manage this space appropriately and take full advantage of its potential? In my experience, many social media management best practices could apply. Let’s explore. Online discussion forums, like social media, are immediate and “always on”. Brands know that social media never sleeps, which is why social media managers constantly need to monitor their various accounts, and respond timeously to posts so that small issues do not spiral out of control. One of the main challenges of online discussion forums is their public nature. Where, before, an irate student may have vented to a lecturer over email, online students can now post their frustrations on a public platform, accessible to all their peers. If other students share their sentiment, the online discussion forum could quickly get out of hand. At least one person from the teaching or coaching team should check the discussion forum each day (several times a day, if possible) and respond to student posts immediately. Working professionals completing online courses are likely to be more active on discussion forums on weekday evenings and weekends. Constant monitoring should help to avoid any potential issues spiralling out of control. When issues do arise, however, it is important that these are dealt with transparently. Transparency is one of the key principles of effective social media management, and applies to online discussion forums too. Transparency, in this case, refers to being open and honest, taking ownership of mistakes, and not concealing information from your consumers. Remember that any reply you make to a student on an online discussion forum will now be considered public knowledge, so think twice before you post. If, for example, you tell a student that you won’t penalise them for a late assignment, because you understand they have had a tough week, other students may expect the same treatment in future. Therefore, it is often wise to take certain conversations off the discussion forum. Social media managers know that a public recognition and apology of a customer complaint on social media should be accompanied by a request to take the matter offline for further resolution. If a student posts a question or complaint, which is only relevant to their personal situation and not the rest of the class, be sure to publicly acknowledge the post on the discussion forum, and then swiftly take it offline where it can be addressed privately via phone or email. Transparency is important, but so is knowing when to move the conversation elsewhere. While social media is often seen as a fun, casual, and conversational medium, brands put a great deal of effort and thinking into creating an appropriate and consistent brand voice online. This voice is not only part of the brand’s persona, but it also sets customer expectations. In the same vein, online facilitators need to carefully plan much of their discussion forum activity. Your teaching team may consist of just you, or it may include a number of people. Either way, you should agree on the tone of your communication on the discussion forum and think carefully about what type of learning environment you want to create. A learning environment that encourages participation and interaction, and has a low barrier to entry, works well. You should aim for a learning environment that is enjoyable, accessible, and relaxed, while still maintaining a professional tone and establishing your position as a subject matter expert. Administrative queries should be addressed promptly and professionally. When it comes to content, however, you should try and engage with your students in an interactive and encouraging way. Thank them for their contributions by name, so that they feel acknowledged. If you can see they are missing the mark, gently guide them to think of things from a different perspective without discouraging or embarrassing them – this is a public forum after all. It is important to remember that many students find the online learning environment confusing and intimidating, especially if they are not comfortable with online channels in general. It is therefore important to set clear expectations. Make the purpose and function of discussion forums clear to students from the beginning of the course. Inform them of how they should go about communicating with you and their fellow students, and how questions will be addressed. If there is something that you anticipate will cause student anxiety, address it beforehand in clear and simple language. Over time, you will learn to start pre-empting the things that cause student anxiety and stress, and address them before they arise. People use social media for a variety of reasons – some want to be entertained, some want to keep up to date with news, and some want to connect and engage with friends and others. Whatever the motive, people should be getting some kind of value from social media. Similarly, when it comes to online discussion forums, facilitators should look for ways to make participation on these forums valuable, engaging, and enjoyable. Friedman (2014) discusses how social media in an educational context can be beneficial for students as it fosters a sense of community and allows students and teaching staff to share information with one another. Discussion forums can be an important space for community building in an online course and could assist students in feeling supported in their studies by having a group of fellow students to draw on. Veletsianos and Navarrete (2012) point out that student collaboration in the context of a social network could “mitigate the problems traditionally facing online learners, such as isolation and lack of support, while contributing to a positive learning experience”. Easy methods of replying to posts, subscribing to threads and “like” and “thanks” buttons under each post, can add to this sense of community and interaction. Encourage students to engage with each other, while making sure your presence is still strongly felt. In addition to community building, online facilitators should start conversations on discussion forums that are related to the course content and that students find interesting and engaging. As social media managers know, posting good conversation starters can be key to engagement and interaction. Try to post topics that stimulate conversation, debate, and varying viewpoints, rather than a straightforward “agree/disagree” topic. Also encourage students to share their own examples or experiences, as this will foster a more personalised and engaging experience for the whole class. Furthermore, as most social media managers know, good visual content can often stimulate engagement and interaction better than pure text can (Hendricks, 2014). Sharing relevant images, videos, and infographics on your discussion forums will spark interest and start conversations. Remember to not just dump this visual content on the forum; provide some context and justification as to why this content is relevant to the topic at hand. Data analytics are key to social media strategy, and most forms of online activity for that matter. Social media managers constantly track and measure the efficacy of their social media efforts and then implement changes to continuously optimise their strategy. Analytics can be used in online discussion forums to track the efficacy of certain topics or conversations and to assist academic staff in their teaching efforts. Never before have teachers been able to monitor the student engagement on their courses in such a data-driven manner. Teachers can now see how active students are and can be alerted to those students who may need a check-in. Data analytics can also allow teachers to see which conversations and topics saw the most engagement, which posts received numerous replies or likes, and the conversational pathways on the discussion forum, and then view these in conjunction with other student data. This information can then be used to tailor your teaching efforts. 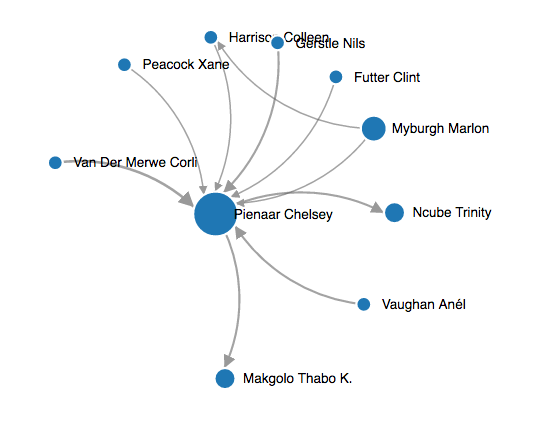 The Forum Graph on Moodle is a powerful tool to understand these interactions. The graph is a visual representation of the forum’s health: number of participants, who is dominating the conversation, and whether students are engaging only with the facilitator, or with each other. Each dot represents a user, and the size of the dot increases based on the number of interactions. The lines and arrows indicate direction of interaction. Figure 1: Left: Low interaction, primarily one-way, one prominent participant. Right: Higher level of participation, increased interaction between students, multiple prominent contributors. The Forum Graph is just one example of the types of tools available to translate student data into meaningful information for teaching. Online education is continuously evolving. Innovative thought is required to improve the experience for students and assist the teaching team in their facilitation. As a method of approaching discussion forum management in an innovative way, the principles of social media management provide a useful starting point. Friedman, J. 2014. Social Media Gains Momentum in Online Education. Available: http://www.usnews.com/education/online-education/articles/2014/11/05/social-media-gains-momentum-in-online-education [2015, November 5]. Hendricks, D. 2014. 20 Social Media Tips To Rule In 2014. Available: http://www.forbes.com/sites/drewhendricks/2014/05/14/20-social-media-tips-to-rule-in-2014/ [2015, November 5]. Molteno, O. n.d. How to Build an Engaged Online Community. Available: http://resources.getsmarter.co.za/resource-centre/building-an-engaged-online-learning-community?rq=engaged%20online [2016, June]. Moodle. n.d. Reports: Forum Graph. Available: https://moodle.org/plugins/view.php?plugin=report_forumgraph&moodle_version=13 [2016, June]. Veletsianos, G. & Navarrete, C.C. 2012. Online Social Networks as Formal Learning Environments: Learner Experiences and Activities. The International Review of Research in Open and Distributed Learning. 13(1). Available: http://www.irrodl.org/index.php/irrodl/article/view/1078/2077 [2015, November 5].